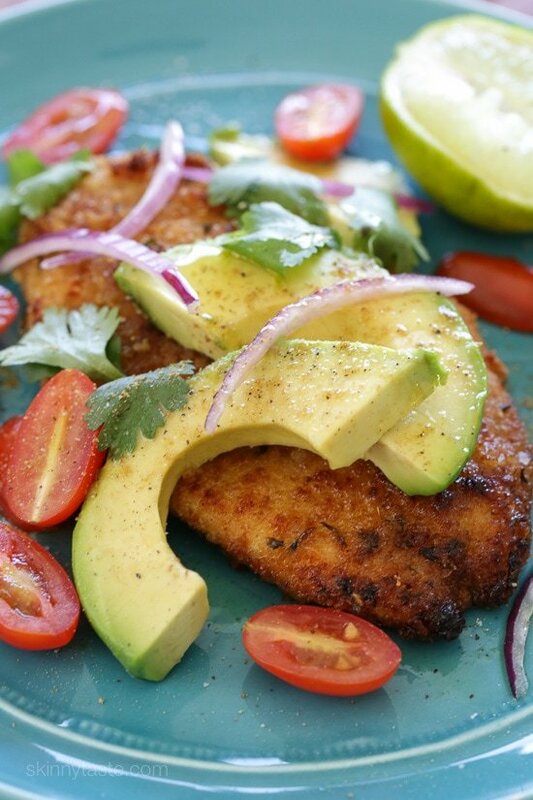 Breaded chicken cutlets cooked in a skillet topped with everything I normally add to my guacamole – sliced avocado, tomatoes, cilantro, red onion and lime juice. If I had some jalapeño I probably would have added a few slices on top as well. This was one of those meals that came together by cleaning out my fridge. Don’t you love those nights? It almost makes me feel like I’m on Chopped, without the cameras, strange ingredients or time limit. I seasoned the chicken with some Latin spices and loved how this turned out. You could even serve it over some chopped lettuce to make it a big salad. Perfect for weeknight cooking, hope you enjoy! 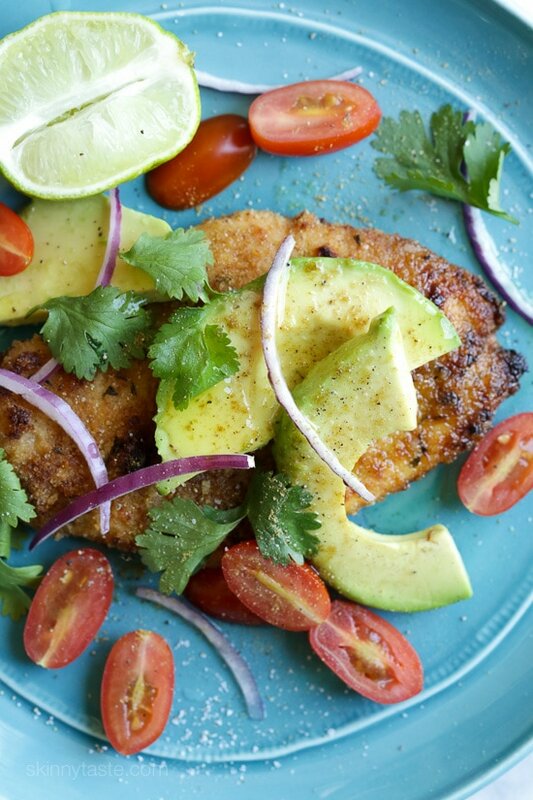 Breaded chicken cutlets cooked in the skillet topped with everything I normally add to my guacamole – sliced avocado, tomatoes, cilantro, red onion and lime juice. Season cutlets with seasoned salt. Place bread crumbs in a shallow bowl. In another bowl beat egg whites sazon together. Dip chicken cutlets in egg whites, then breadcrumb mixture, shaking off excess. Heat a large nonstick frying pan on medium heat. Add the olive oil. When hot add the cutlets and cook about 6 minutes on each side, until golden brown and cooked through. In a large bowl combine the avocado, red onion, tomato, cilantro, salt, pepper, cumin, and lime juice. Gently toss and serve over the chicken with additional lime wedges. Wow! My kiddos took one bite each and said, “This is a make-again! ” Husband was extremely pleased too. I made the sazon minus the turmeric and it was still great. I also only had unseasoned bread crumbs on hand and whole wheat panko as well so I did a 50/50 mix and added chili powder and smoked paprika…fantastic! A tip for those who shy away from red onion: My mom always slices her red onion and then soaks it in ice water to take off the bite, and I’m usually in such a hurry that I forget. I finally remembered and it makes a huge difference! I just soaked it first thing before starting anything else and by the time I tossed the deconstructed guac, it was perfect! This is fantastic. My family loves it. This is one of our absolute favorite dishes! We love the salad and the chicken! I cheat a little bit, and use thin sliced breasts so I don’t have to split two breasts, and for cooking I do two at a time. I use half the oil on the first half, and half the oil on the second half. I think this allows for a better crisp on the chicken. It is a true winner, and if I were not so picky my husband would agree to this every week! 1) I’m a huge fan and am eager to try this next week. I’ve been wanting to try doing something with chicken cutlets for a while since it seems to come up for some really great sounding recipes. Time to finally bite the bullet! Thanks, got it fixed. Hope you enjoy it! Delicious! I actually had some turkey breast chops thawed and used them!! So good!! We love this chicken, it’s so crispy tastes great too! I love this recipe. It’s so easy to do and delicious. My husband is also a fan . Made this one LAST night – absolutely delicious. I love your comment about cooking on Chopped – when my kids were younger I would envision myself hosting a cooking show, while the gang wandered around the kitchen interrupting me, and I would create some amazing things just by opening the fridge and using what ingredients I had – I love to cook, and you create food the way I love to create food. Doesn’t hurt that you have a lot of Mexican ideas, as we do a lot of boating down there and it is my favourite type of food ( for now)! keep up the good work! SO easy and SO delicious! All the toughest food critics aka my family gave it rave reviews. I served it with corn tortillas and your Southwestern black bean salad which was also amazing. Thank you Gina!!! We made this tonight and it was delicious!!! I wanted to let you know when I entered the nutritional information on WW, it came out as 6SP…bonus!! I got 7 SP by entering the ingredients. Yet another home run by Gina! The adobo and sazon take this up a “whole nother” level. My whole family thanks you! Yet another home run by Gina! The adobo and sazon take this up a “whole nother” level. My while family thanks you! This was absolutely delicious! My 5 year old loved the chicken! Hubby approved and my mother-in-law said she was eating it slowly it was so good lol The next day at lunch I wished there were leftovers. 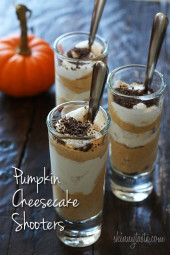 Definetely making a double batch next time! Thanks for such a wonderful recipe. Aww so happy you all enjoyed it!! This was DELICIOUS. Made it for the first time tonight and it was YUMMMMY. I am going to make this at least once a week. The green and avocado make it. And the chicken coating was delicious also. 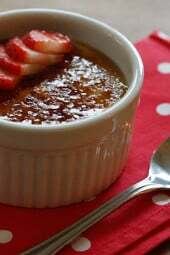 Made this recipe and it was a hit!!! We are having it for dinner tonight too!!! I have made this soooo many times. It is so easy and good. How do you think it would be with a thinner, boneless pork chop? Hi Gina! I love these breaded chicken cutlets and your website/book in general! Can you post the nutritional info for the cutlets alone (without the deconstructed guac)? Many times I eat the cutlets alone or with a different side instead of as posted and just curious to know the nutritional info so I can log properly. Thanks! I am a 66 year old retired man and I love making your recipes for my wife and extended family. I am getting a reputation as a good cook!! 🙂 – However many times I am at a loss of what to serve with the main course. I look for suggestions in the comments from other members but to often I scramble at the last minute. Should this be made with whole wheat or regular breadcrumbs? Can you give any substitutions for Adobo seasoning ? Not sure what it is made up of. Also can you tell me what Sazon is please? I am a competent cook but have never heard of either of these here. A thought for your UK following is to give substitutions, but it must be difficult to know what is not common or readily available in Engkand. It is very difficult to know what is not available, but I’m always available for questions! for the chicken you wrote: “2 (8 ounce) boneless chicken breasts, cut in half legthwise.” Do I use 2 8oz chicken breasts (16 oz total)? Made this tonight and it was delicious. I wish we had more leftovers. This was so good. The kids, 5, 2, & 1, all loved the chicken. My husband closed his eyes and said he felt like he was eating at a restaurant. And then he asked if it was from skinnytaste. When I said yes, he said this is his favorite website. It’s mine too! I made this with tilapia instead of chicken, because my husband won’t eat chicken. It was delicious. Thank you! What are some sides that would go with this? Gina – I absolutely love your recipes. I usually make a couple each week (sometimes even every night!) I like to print my recipes and put them in a page protector to have in the kitchen when cooking.Then they go in a binder for next time. You have recently changed the print format on your site and there is no longer the option to click to remove text before printing. So now when I print a recipe it is either pages long because it includes all of the text before the recipe or I have to copy/paste and edit to take that out and make it shorter. Is there any way to change this? If not I will continue to edit them down for my personal. And you continue giving us these fantastic recipes! Thank you! Your recipes have been a huge part of my success on Weight Watchers! There’s an extension for the chrome browser on the computer that can be used for this. Sorry I can’t think of the name but if you search in the extension store it has a green printer icon. Made this tonight! It was DEE-LI-CIOUS!!! I thinks it’s great that you can come up with something so good out of ingredients you have on hand. This is a keeper in our house! Are the breadcrumbs whole wheat or regular? Made this tonight and it was devoured! Thanks for introducing us to sazon…had never heard of it before. Will be looking for other ways to use it now. This is definitely going into our rotation immediately! I made this last night for dinner and what a hit! Absolutely delicious. I had to substitute white balsamic vinegar for the lime juice (my son’s girlfriend is allergic to citrus) with great results. Super easy weeknight dinner that had hubby and son vying for the last piece of chicken. Made this last night and chicken was a HUGE hit with all 3 kids! Deconstructed guac was amazing–made more so I would have some for lunch today. This will be in my regular dinner rotation. Thank you! Gina~ thank you so much for incorporating the Points Plus values too. It’s so much easier than SmartPoints for me. I made this last night as soon as I saw it with leftover ingredients in my fridge. It was delicious and hubby approved. We will be making this again very soon! Looks incredible Gina! I love the deconstructed guacamole! Thank you for sharing! What’s a good substitute for Sazon seasoning? Can this be baked in the oven instead grilled in the pan? How long should it be baked for? Thanks! This looks absolutely amazing! I would love to have this for summer. I love simple, versatile meals like this! So easy to throw on a bit of whatever you have. Yum!! Your guac is the best, so deconstructs is a brilliant idea. The photo makes me want to grab a knife and fork. Yum! Gina, I love your recipes, and have been making them for years! I have recently moved from the US to a small town in South Africa. I’v been struggling to find certain ingredients, and one of them is breadcrumbs. What’s a decent substitute? I have used ground cornflakes but that is a bit too sweet for my taste…. You can make your own breadcrumbs with old bread, cut it in squares and let it get hard then add to the food processor. Chili powder, is this something you can purchase online? I am originally from South Africa – Chili powder is called peri peri and it can be bought in the powder form. Bread crumbs can be purchased but one often makes their own. 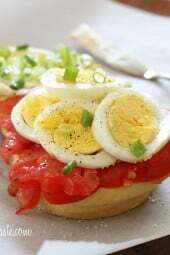 Just toast bread slices and blend it up. Hope that helps you.